On occasion you meet a couple deep in a romantic entanglement and wonder, "What does X see in Y?" (or: "Why doesn't X see that Y is a total jerk?). In answer, your thoughts run to low self-esteem for one and more-than-what-meets-the-eye for the other. For me, those questions were recurrent while reading The Newlyweds. 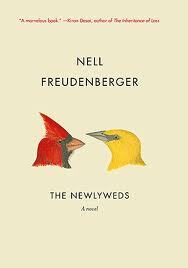 As much as I enjoyed the effortless craft of Nell Freudenberger's writing in The Newlyweds—the woman writes enviably lovely sentences, ones that don't try too hard—and felt that spending time with Amina, the novel's protagonist, recently transplanted in upstate New York via Bangladesh, would be pleasant (Amina is, after all, smart, loyal, observant, and essentially good), George—the man she meets online, eventually falls for, chooses to marry, and moves across continents to live with—isn't a total jerk or complete bore, but as far as I could discern he's not far from either quality. He complains (a lot); he's a habitual naysayer; he's lacking in the spirit of adventure; he's not curious; George seems to have all those settled characteristics of middle age well before actually turning forty. And, my inner gold digger says, he's not rich enough to compensate for the qualities he sorely lacks. Picture Clint Eastwood in Gran Torino as a thirtysomething electrical engineer (or Steve Carell in his khaki Dockers and white New Balance sneakers at the beginning of Crazy, Stupid, Love), and you're in the ballpark. An unlikable character is no crime, of course, but in the case of Amina and George, that question— "What does X see in Y? "—popped up almost every time George made an appearance. His allure, at least to me, remained elusive. Maybe he's just not my type. Thankfully, Amina is at centre stage throughout The Newlyweds, and seeing American cultural norms through her eyes and watching her struggle to find balance between what she grew up knowing and has newly learned since arriving in Rochester six months earlier is delectable, a stimulating treat.